Author bio: For over 30 years she has been working in New York as a Ph.D psychologist and psychotherapist. She is a a therapist, speaker, relationship expert and workshop leader. She has written many critically acclaimed books. Blurb: The 21 Basic Laws Of Successful Relationships. In Dr. Shoshanna's ultimate relationship guide you will find answers to common relationship problems. There will be instruction, exercises and wisdom never brought together in one program. 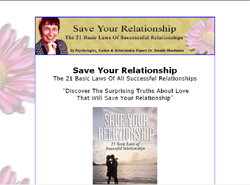 SAVE YOUR RELATIONSHIP : 21 Basic Laws of Successful Relationships e-book is filled with techniques, examples, discussion, and step by step guidance. You will learn how to overcome the most difficult relationship problems, and create the relationships you've always dreamed of. This simple, direct and effective program has worked for hundreds. 5. How to respect yourself and your partner - Your independent well-being is a must, for a healthy relationship with another. Mistake #8 Being addicted to fighting. -Real communication - What is it? -How to renew your love for each other.